OENOTHEQUE Selection the best examples of Bulgarian Merlot wines. Since many decades the name of STAMBOLOVO WINERY is traditionally associated with the best examples of Bulgarian Merlot wines. True to our roots and traditions, we safe-keep unique oenotheque and collectors' wines from old vintages in the underground vaults of our cellar in Stambolovo. Oenotheque wines from 1980-es and '90-es in original bottles and with original cork stoppers are what we have for wine lovers and collectors. 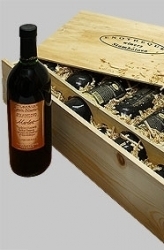 To the true connoisseurs we offer our and collectors' sets of 3 or 6 bottles of unique aged old-vintage Merlots. We also have a fine selection of collector's and oenotheque wines of various variety and year of vintage, coming in 3-bottle sets. These are rare and valuable examples of wines in their original bottles and with genuine labels and corks, which we have in the past created for and exported to our clients in a number of European countries.